Liberty men’s basketball head coach Ritchie McKay was named the 2019 Jim Phelan National Coach of the Year today. The award is presented annually to the top coach in Division I men’s basketball. Last month, McKay was one of 25 finalists for the award, joining the likes of Tennessee’s Rick Barnes, Michigan’s John Beilein, Texas Tech’s Chris Beard, Virginia’s Tony Bennett, Kentucky’s John Calipari, Gonzaga’s Mark Few, Michigan State’s Tom Izzo, Purdue’s Matt Painter, North Carolina’s Roy Williams, Wofford’s Mike Young, and Houston’s Kelvin Sampson. The award is named for legendary coach Jim Phelan who was a long time head coach at Mount St. Mary’s where he spent his entire 49-year coaching career, compiling 830 wins in 1,354 games. 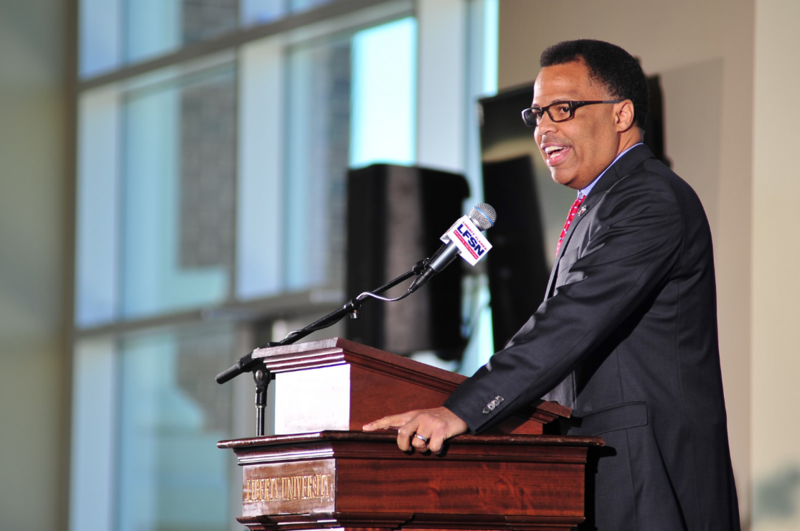 He was inducted into the National Collegiate Basketball Hall of Fame in 2008. Past award recipients include Chris Holtmann, Frank Martin, Greg Gard, Bob Huggins, Mike Brey, Jamie Dixon, John Calipari, Bo Ryan, Tony Bennett, Ben Howland, and Tubby Smith. McKay helped guide the Flames to its 4th ever NCAA Tournament appearance and first ever win in the Big Dance when Liberty knocked off 5-seed Mississippi State in the first round. He also led the team to a school record 29 wins, a share of the ASUN regular season title, and the ASUN tournament title. McKay has also led the Flames to 3 straight 20-win seasons, something never before accomplished in school history. McKay was awarded a 6-year contract extension, which was announced Thursday.